Richard Hays’ 1989 publication Echoes of Scripture in the Letters of Paul was—without exaggeration—a watershed moment in New Testament studies. Hays’ careful theological and exegetical analysis of the way the Scriptures of Israel reverberated through the corridors of the Pauline epistles sparked a hermeneutical conversation across the theological landscape. Teachers and students were required to read Paul again—to hear afresh the way the apostle called forth Israel’s narrative within early Christianity. 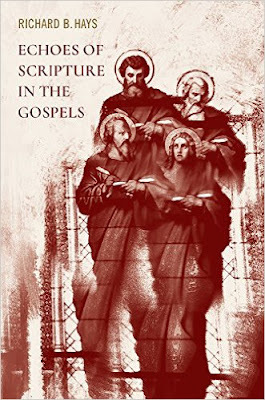 Nearly thirty years later, Hays has provided another masterful foray into the hermeneutical question of how the New Testament authors read Scripture: Echoes of Scripture in the Gospels (Baylor University Press, 2016). In this volume Hays turns his attention away from Paul and toward the authors of the fourfold Gospel. His primary aim, in his own words, is to offer “an account of the narrative representation of Israel, Jesus, and the church in the canonical Gospels, with particular attention to the ways in which the four Evangelists reread Israel’s Scripture” (7). Hays describes the key for this interpretive task as reading backwards or figurally—by which he means that the Evangelists’ engagement with the text is primarily retrospective. Again, to quote Hays: “the Evangelists were convinced that the events of Jesus’ life and death and resurrection were in fact revelatory: they held the key to understanding all that had gone before” (358). The re-interpretation or re-narration of Israel’s story for the life of the church is necessarily mediated through Jesus. Luke’s Christology of divine identity requires a fundamental rethinking of our notion of “God.” Jesus is the Kyrios; the Kyrios is Jesus. God is therefore not a concept subject to general philosophical elucidation but a “person,” an agent known through the complex unfolding of his narrative identity—and only so. And precisely for that reason, the “low/high” christological categories collapse completely. God discloses himself to us precisely in lowliness (280). The key emphasis here is Hays’ rejection of the artificial construction that certain Gospel authors develop distinctly “low” or “high” Christologies. He argues convincingly that the Gospel authors are re-narrating Israel’s Scripture in their own context precisely to engage with the mystery of how Jesus can simultaneously embody both Yahweh and humanity. For Hays, it is in recognizing the Evangelists’ figural reading of Israel’s Scripture that we are enabled to understand the complexity and depth of their narratives. “For the Evangelists, Israel’s Scripture told the true story of the world. Scripture was not merely a repository of ancient writings …; rather, it traced out a coherent story line that stretched from creation, through the election of Israel, to the telos of God’s redemption of the world” (360). Importantly, Hays’ delineation of this Scriptural storyline is a reminder that the interpretive task never ends with narration. The Evangelists’ reading of Scripture does not culminate in mere exegetical assent. Rather, their portrayal of Jesus is also a call for the church to participate in that narrative. It is a commission to Christian discipleship. This, it seems to me, is what we have in Hays’ volume: an act of Christian discipleship that seeks “to carry forward the story of Jesus with new freedom and faithfulness” (366).